Engineering News Record NW features the renovation of Yesler Way Bridge. ENR Northwest November 2018 cover. The renovation of Yesler Way Bridge is featured in this month’s issue of Engineering News Record (ENR) Northwest, and tonight our project team gets honored for their good work on the Yesler Way Bridge Rehabilitation Project. The effort won ENR Northwest’s Best Project Award for Renovation/Restoration. Judges reviewed more than 30 projects located in Oregon, Alaska, and Washington state, and this evening in Seattle presents the regional awards. The winners have a chance to be the ENR ‘Best of the Best’ in their category, as judges from across the country compare all submittals nationwide, as they have in years past. Making a mark – a landmark. The Yesler Bridge is one of Seattle’s oldest permanent steel roadway bridges, originally built in 1910—long before Interstate-5 cut through the hill just east of it, and, back when the Mayor’s Office was in the iconic trapezoid structure built prior to the regrading that lowered street levels on Terrace and 5th Avenue. *This key rehabilitation eliminated the risk of collapse, should a vehicle strike a column of this formerly multi-span bridge! Yesler Way Bridge project rendering | Key rehabilitation elements identified. The rehabilitation team worked with the Pioneer Square-Skid Road National Historic District; Pioneer Square Historic District; and International Special Review District to maintain the bridge’s historic pedestrian railings, fascia girders, ornamental columns and cladding, capitals, corbels, and light fixtures. You know the old saying, “it takes one to know one…”? Well, the Engineering News-Record (ENR) launched about 35 years before the Yesler Way S bridge was built! 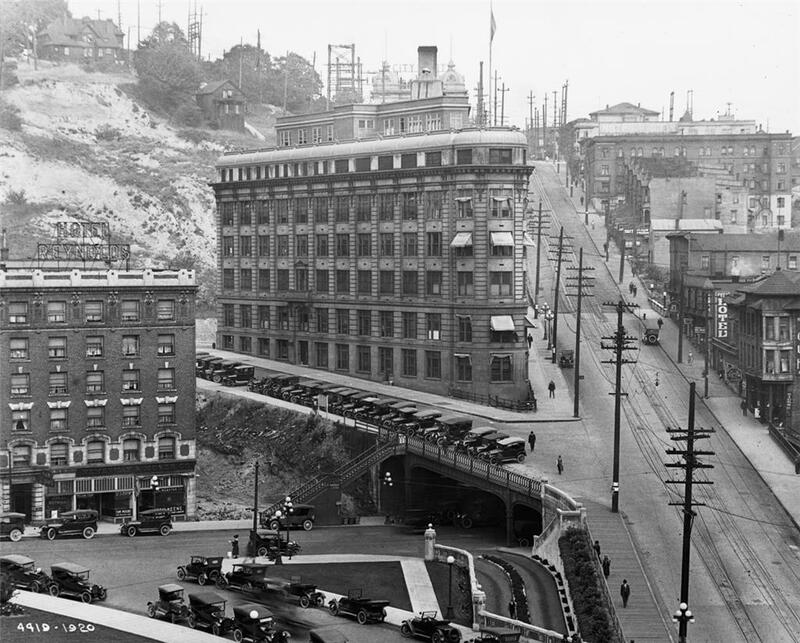 Even then, Engineering News covered many Seattle projects, including the call for bids to pave Yesler Way with granite blocks and the Cedar River flood of November 1911. That 140+ years of industry expertise makes the ENR Best Projects program a brass ring for teams to strive for. Visit http://www.enrbestprojectsawards.com/ for more information on ENR regional awards events. Congratulations Yesler Way project team! Halloween & Day Light Savings (ends) Safety Tips. It’s T-minus 36 hours until trick or treating, which means excitement is building for little kids everywhere as they envision their Halloween candy hauls to come. And let’s be honest, parents, you’re at least a little pumped to pick through said haul after your little goblins go to bed. Give yourself plenty of time to reach your destination. With speed, the frequency and severity of collisions increase #physics. On residential streets, remember 20 MPH is plenty. If you’re driving, be mindful that trick or treaters will be out and about. Slow down, pay attention, and stop for people walking (remember: every intersection is a legal crossing). If you’re out walking, bust out the glow sticks and flashlights, and remember to look both ways and make eye contact with drivers before crossing. Maybe you’re out for a night of boos booze? Make good choices and plan ahead for a safe way home. Hop on a late night bus, hail a cab or rideshare, or buddy up with a designated driver. You know the drill. Also, Seattle Police will be conducting extra DUI patrols tomorrow night. The sun sets at 5:55 PM tomorrow and it’ll likely rain – the combo of darkness and drizzle will affect visibility. Children-involved car/pedestrian collisions are nearly twice as likely to happen on Halloween than other days of the year, so it’s especially important to see and be seen (we’ll refer you back to tip #3 above). And looking ahead to this weekend, the clock turns back on Sunday (farewell daylight savings, hello darkness my old friend). Days will get darker, so it’ll be even more critical to look out for each other. Thanks for helping make Seattle’s streets even safer!